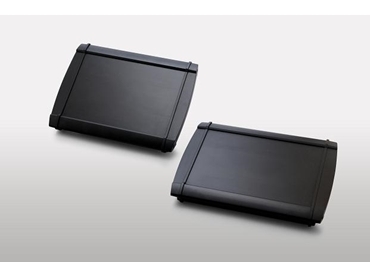 BOPLA’s Alu-Topline series of enclosures, frequently used in data recording and processing applications is available from Rubin Group . Well-known for their ergonomic lines, Alu-Topline enclosures offer several advantages for users including variable lengths, suitable design lids that function as a profile end, pleasant surface feel and the corresponding design. Alu-Topline enclosures are increasingly being used in the fields of modern audio and studio technology. A high-quality coating gives it a superior shade of black, which is standard in this sector. BOPLA has operated successfully for more than 40 years in the field of enclosure technology.